"Ya RasoolAllah you are that Noor that the full Moon is brightened by your Noor and you are with your beauty and elegance a shining sun." Once you visit Madinah Tul Manawarrah your heart becomes owned. 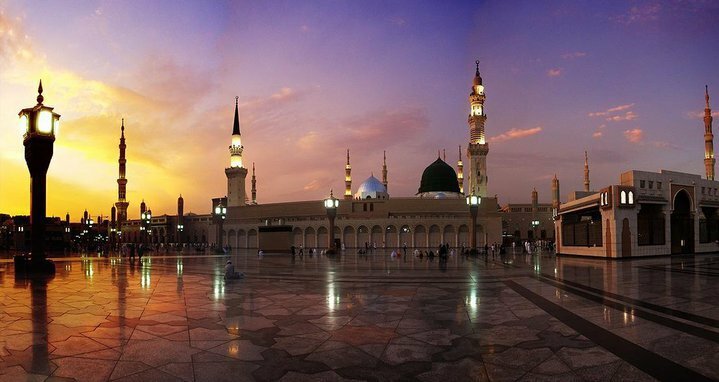 Once you are about to leave the City of Madinah tul Manawarrah the heart that has become owned is heart broken. This new heart that has been filled with love of the Beloved’s City is so strong that you do want to leave. At that moment tears begin to flow down your cheeks with hope of remaining in Madinah tul Manawarrah. Once your eyes see the Beloved Green Dome for the last time, instantly they have become owned! Once you leave Madinah Manawarrah, your eyes are constantly flowing with tears of love, emotion and sadness with the question in your mind, When will I see the Blessed Green Dome again? Oh Beloved of Allah please call us back to Madinah tul Manawarrah. Now here in my home still thinking of those precious moments of Madinah tul Manawarrah. When will those moments become reality again? Ya RasoolAllah Please call us all back.